Ditch the doilies and flowery porcelain teapots, and travel to Adagio Teas for a 21st century tea experience, located at 617 N. State St.
Adagio began as an online tea store headquartered in Clifton, New Jersey. Although Adagio made a healthy profit during its first decade, the company chose to expand its business from the Internet to the streets. 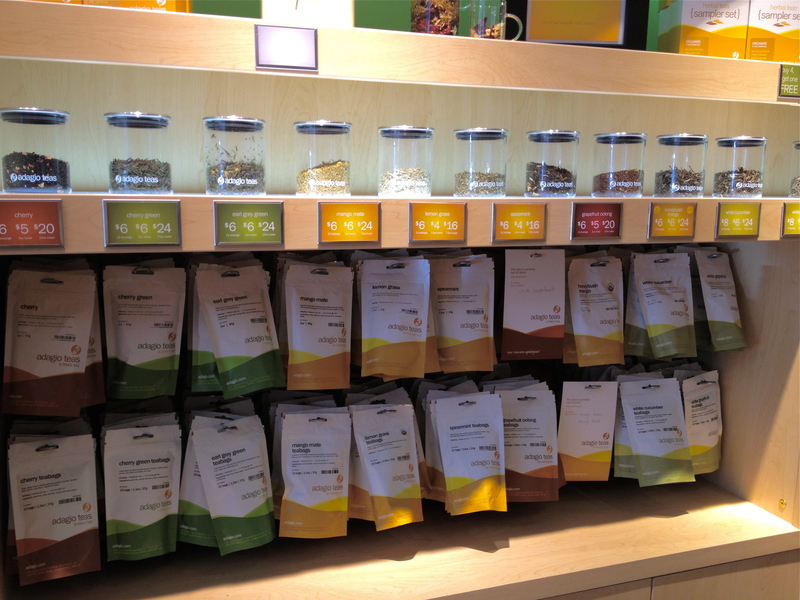 It would have been easy to set up shop in New Jersey or New York, but Adagio Teas selected 3 cities in Illinois – first Naperville, then Skokie, and finally Chicago. (Tip: Don’t forget to bring your Belly Card! Earn 15 points and grab a tea to go!). 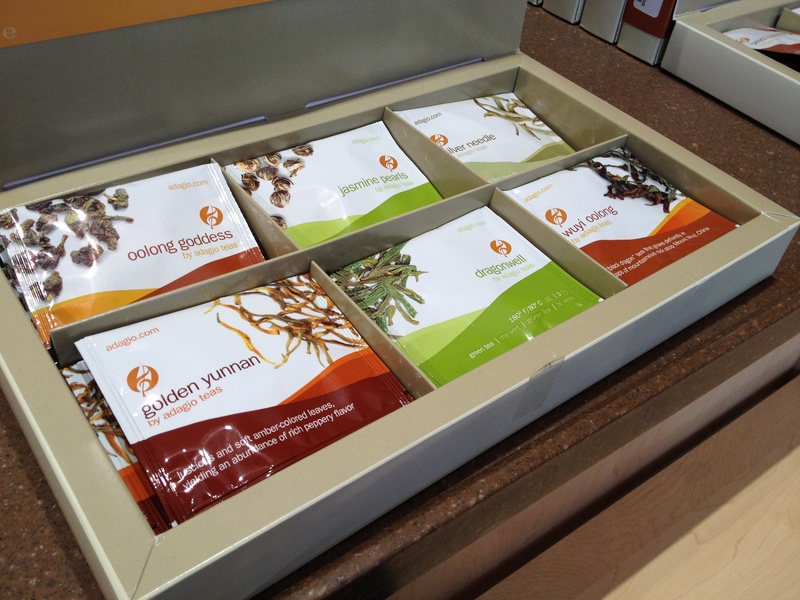 What sets Adagio apart from other modern teashops is its variety of teas, tea snacks, and tea wares. (Tip: Enjoy a perfect cup of tea with the Tasting Set. For $9 bucks you can sip tea like the professionals every day!). Adagio carries more than a hundred teas varying from the traditional English Breakfast Tea to Jasmine Phoenix Pearls, sold in loose-leaf form and teabags. The store also has a long tea bar for you to sample its unique tea blends. Some are simply fruity, while others have healing/cleansing components. Try the Happy Belly to settle your stomach or the Sleepy Brew to have sweet dreams. The staff members at Adagio are tea experts, which is why you’d want to take tea lessons at the store Tuesday or Thursday night. (Tip: Visit the Adagio Teas Chicago website for Groupon deals. Book a class at a fraction of the cost!). Learn how to properly brew tea, cook with tea, and combine different teas. Not only will you gain all this knowledge about tea, but you will go home with complimentary packets of tea and tasty treats. 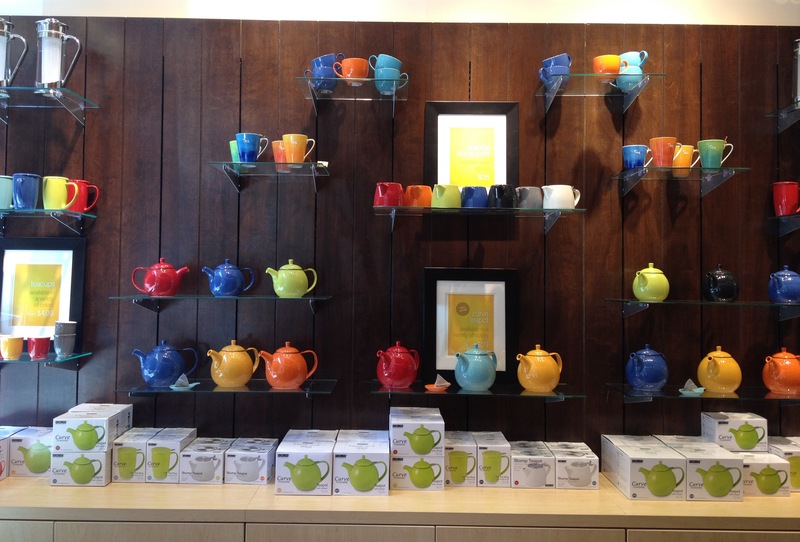 Step inside the Adagio Teas store today! (Tip: Now that it’s summertime, check out Adagio’s special Iced Tea Set!). Adagio Teas is open Monday through Friday 9:00 a.m. – 7:00 p.m., Saturday 8:00 a.m. – 7:00 p.m., and Sunday 12:00 p.m. – 6:00 p.m. This is a video featuring the Adagio Teas store in Naperville, IL. The location on State Street doesn’t have the exact same layout, but it does give you an idea of the Adagio experience. If you prefer shabby chic interiors, walk to P.O.S.H. Chicago (613 N. State St.) to decorate your home with “one of a kind” wares. Pick up vintage coronation plates from England, 1950s American diner mugs, or Parisian perfume bottles. Toast to a special occasion or just for the heck of it at Pops for Champagne (601 N. State St.). Pops has an abundance of champagne and sparkling wines, as well as small bites like cheese and charcuterie. If you want to be a tad adventurous, try a champagne cocktail. I fully recommend ordering La Vie en Rose, which contains elderflower liqueur, sugar cube, Peychaud’s, and brut champagne. Imagine taking your favorite childhood food and elevating it. That’s exactly what Chef Graham Elliot did when he created Grahamwich (615 N. State St.). It’s a restaurant that serves fun food, such as grilled cheese with tomato marmalade, truffled popcorn, and cinnamon stick soft serve. A loyalty program that will make your Belly happy! As you can see, the process is simple! Each time you scan your Belly Card or Belly App at your favorite restaurant, shop, etc. you rack up 5 points for that location. (Tip: If you forget your Belly Card at home or can’t access the Belly App from your smartphone, don’t panic! Just type in your e-mail address on the iPad!). By joining Belly you’ll not only support local businesses, but a local company. 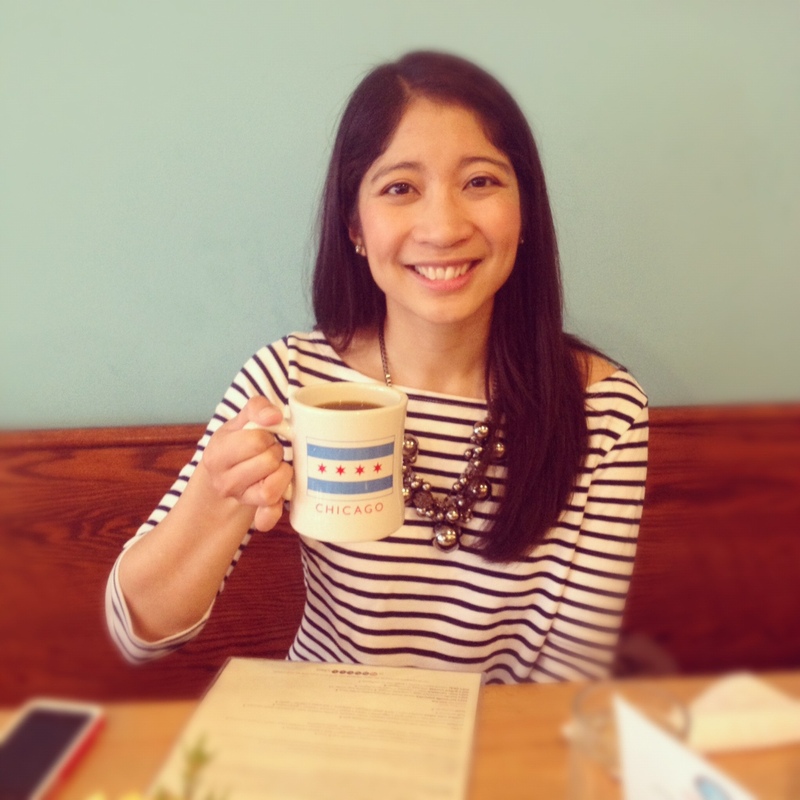 Like Groupon and GrubHub, Belly started right here in Chicago! Follow Flop the Belly Dog and grab a Belly Card today! (Tip: Use your Belly Card during the Do-Division Street Fest this weekend to earn double Belly points!). 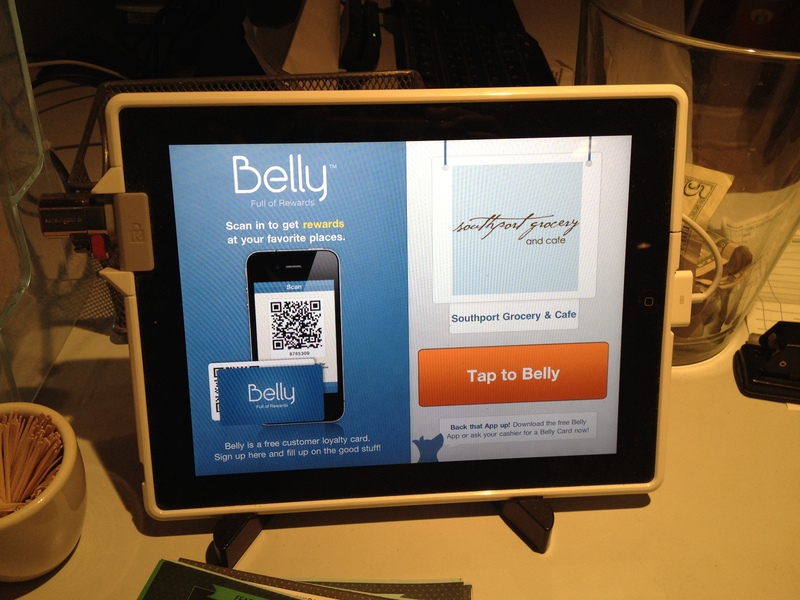 Look for the Belly iPad at your favorite places! Easy process: Scan the Belly Card (left) or Belly App (right) to the iPad!